Bushfires are expected to become more extreme. The devastating fires that struck Wye River in Victoria on Christmas Day are, from an emergency response perspective, a success story. Despite the loss of 116 houses in the coastal town and nearby Separation Creek, nobody was killed. The fire may have destroyed homes and in some cases livelihoods but the community presented a united front in terms of supporting one another and heading the evacuation warning, which was issued in plenty of time. I spent the first part of January working with fire agencies to surveying the damage to houses in a bid to understand the impact of the fire. The community is truly thankful that no lives were lost in this terrible event. The debate now shifts to how the community will rebuild to withstand future and fires and other issues such as land instability. Other communities have not been so lucky. The town Esperance in Western Australia was hit by fire in the 15th of December resulting in four lives and two homes lost. Two lives and 91 homes were lost in a fire north of Adelaide South Australia on the 25 of December and two lives and 121 homes were lost in the township of Yarloop in Western Australia on the 6 January. As we look back over this summer’s fires and reflect on how communities and emergency services responded, we need to consider how the risk of fire is changing in a warming world. Evacuation works well when there is sufficient warning and everyone decides to leave. It is reasonable for authorities to pick a threshold and say “it’s time to leave your home”. But when this happens, the community has to act as one. Wye River did that very well; there wasn’t anyone left in the affected area except firefighters. This reflects a sense of shared responsibility for community safety between residents and fire authorities. In Australia between 1900 and 2010, a total of 674 civilian lives were lost in 260 bushfires. Analysis of these deaths has focused on the relationship between where people were killed, weather conditions, proximity to fuel, activities and decision-making leading up to the death. We now know that most deaths occurred under very severe weather conditions. A number of recommendations came out of the Royal Commission into the February 2009 Black Saturday bushfires in Victoria, including the need for an enhanced warning system. This resulted in a new, “code red” warning level on the bushfire weather severity scale. For code red days, people in bushfire-prone areas are encouraged to listen to advice from agencies and leave their homes either the day before or early in the morning on the day the weather approaches this level. This has been adopted in many regions across Australia as an accepted strategy. Bushfires on code red days dominate loss statistics. 70% of house losses and 60% of deaths occurring on days which reach this level. Thankfully none of our towns and cities have experienced a code red day this summer. Mass evacuations will not necessarily always be the easiest or most practical solution for all bushfire circumstances. In Victoria, you can’t forcibly evacuate someone from a property where they have a personal interest in protecting that property. In Wye River, the evacuation warning worked and people were more inclined to leave than stay and try to protect their homes. The warning work because it was issued well ahead of the fire. The community had previously considered their approach to the threat of bushfire and formed a unified approach to warnings. In other areas the communities response to warnings may be more diverse. With the introduction of code red warnings, it is likely more people will evacuate following a warning. What’s concerning is people who do decide to stay with their homes despite an evacuation call may be in more danger than ever before. They could be the only resident left in their street fighting to protect their home, potentially making them more vulnerable. In the past resident needed to plan for a range of fire weather scenarios and decide at what level of fire weather severity they would leave. This also includes planning for how to defend their home if for some reason they do not leave or a fire arrives on a less severe day. Now residents need to also consider the extent to which the rest of their community is likely to leave the area. At the start of a bushfire season we don’t know if one or more code red days will occur. A code red day can only be reliably predicted in the week leading up to it. Unfortunately we are likely to see more code red days in the future. Typically on a code red day there are hundreds of fires in the landscape and firefighters battle to put most or all of them out. It’s an amazing task and they do an excellent job. But obviously there’s a chance that some could grow to a size that becomes impossible to control. Have we seen the worst fire weather that is technically possible? Nobody knows for sure, but probably not. Climate change projections indicate that south eastern Australia is likely to become hotter and drier in future. 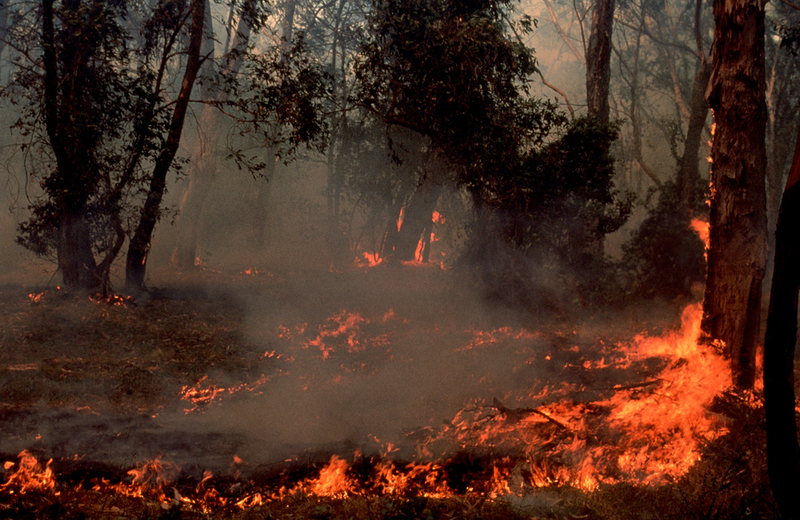 A 2007 study examined the potential impacts of climate change on fire-weather at various sites in south east Australia. It found that at all locations the likelihood of code red days occurring will increase. For some sites the change is minor by 2020 but for other sites such as Bourke, Melbourne Airport, and Mildura the frequency will more than double. As we approach 2050 the news is far worse, with some areas such as Bourke, Melbourne Airport, Mildura, Moree and Wagga increasing in likelihood by more than five times. The study also found that fire seasons will start earlier and end later while being generally more intense throughout their length. This effect will be the most pronounced as we approach 2050 although it is likely to be apparent now. By 2050 we can expect to see more uncontrollable fires in our landscape under the more severe weather conditions. A lot more of the landscape will be burnt. In many regions major fires will be frequent enough to constantly remind people of the risks associate with them. With these observations we need to consider new ways of accepting the inevitability of these fires and adapt. By adaptation I mean a combination of building practices and landscape design that match the fire-prone land we live in. Perhaps one day instead of lamenting the losses from bushfires, we will be able to feel content as the environment recovers around us. Justin will be on hand for an Author Q&A between 3 and 4pm AEDT on Thursday, January 21, 2016. Post your questions in the comments section below. Could the Aussie barbeque go up in smoke?